Closely parallels the Cache la Poudre River. Offers views of five miles of Poudre Canyon. Heavy traffic common during weekends, particularly summer. Drive with care. Boaters and anglers should be cautious in spring and early summer as snowmelt produces dangerous high waters. No hiking or biking trails along SH 14. Bike lane along the paved highway is narrow and not available in places. Poudre Valley Canal is among first ditches in Cache la Poudre irrigation system. 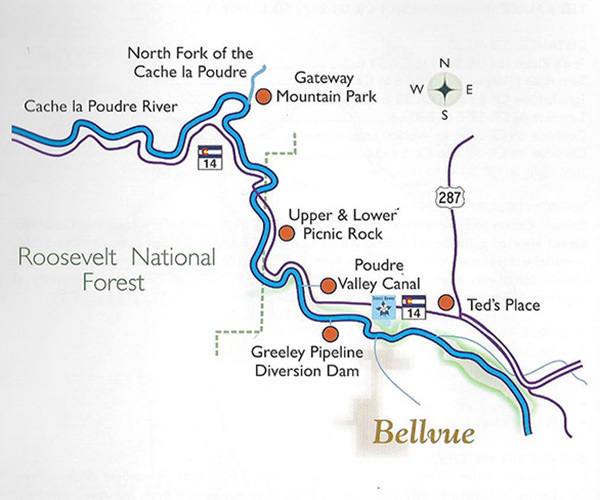 The Greeley Pipeline runs southeast to Greeley, where water is treated at Greeley Filtration Plant and used for municipal and domestic needs. Pipeline was originally built in 1907. Crosses Cache la Poudre River after turning off US 287 and before reaching Goat Hill. Great view of agricultural landscape of Larimer County and Hogbacks. On Road 25E, parallel a Pleasant Valley and Lake irrigation ditch. Pass through Bellvue, an attractive historic community that retained much historic integrity. Ends at charming community of Laporte. Also pass Bellvue Hydraulics Laboratory. Pleasant Valley Canal and Lake Canal: Built in 1861. One of the earliest ditches along Cache la Poudre River. Flows over 25 miles, does not have a dam, but uses a naturally occurring feature to divert water near mouth of canyon gauging station. Bellvue Hydraulic Irrigation Laboratory: A field experiment canal on Cache la Poudre River adjacent to Jackson Ditch (aka Dry Creek Ditch). Built around 1921 as field laboratory for research into irrigation technology. Ralph Parshall tested new water flow measuring device, the Parshall Flume, completed in 1926. Provided more accurate and efficient methods to monitor flow of irrigation canals in arid West. Located on private property, not available for public access – please respect owner’s right to privacy. At Laporte turn right (south) at CR 54 G at intersection with Overland Trail Rd. 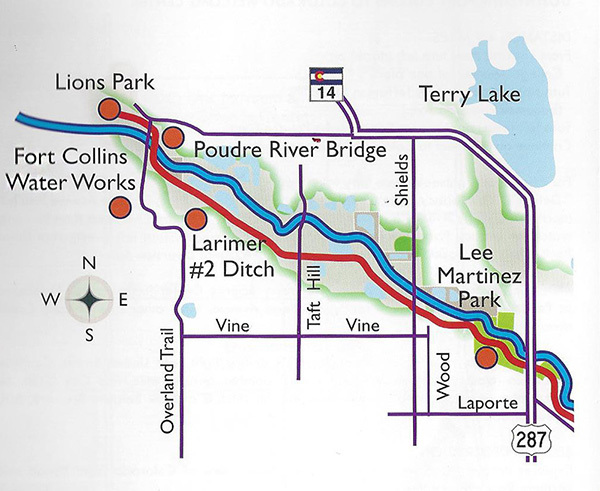 Laporte and historic northwest section of Fort Collins. Excellent opportunities to explore exciting historic resources associated with Heritage Area themes – water law and irrigation. Ends at Old Town Fort Collins. Larimer Number 2 Ditch and New Mercer Ditch: These two ditches run parallel for much of their courses. New Mercer was built in 1869, Larimer Number 2 in 1873, to supply water for irrigation domestic use. Larimer Number 2 was first canal in Fort Collins to irrigate bench lands above river. * Detour 1. Visit Legacy Park to explore area rich in history. From Laporte Ave turn left (north) on College Ave and continue until you cross the Poudre River. Less than 1/4 mile watch for Legacy Park sign on left side of College Ave. Turn left (west), cross Union Pacific Railroad tracks. Soon after, on right, is Lake Canal diversion dam. ** Detour 2. Fort Collins Museum and Discovery Science Center located at Poudre River at Cherry Street and College Ave. View other side of Lake Canal diversion. *** Detour 3. Take Jefferson Street, turn left at first light onto Linden Street. Continue on Linden (cross Burlington Northern tracks) another quarter mile, find Coy Ditch. An interpretive wayside exhibit commemorating this ditch is at New Belgium Brewery, 500 Linden Street. 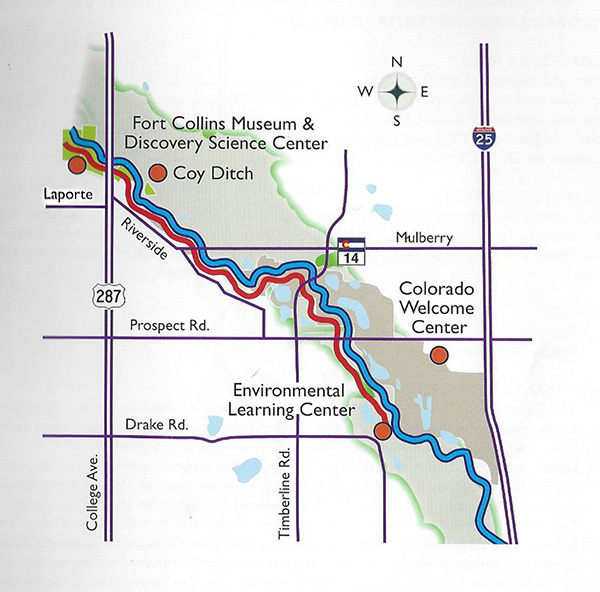 Explores northern and western Fort Collins. Great view of Colorado Front Range and northern Rocky Mountains. Coy Ditch: Built in 1865 the ditch irrigates a limited geographic area. One of the oldest still in operation. Area retains agricultural flavor of Larimer County. Turn south on CR 5; exceptional view of Colorado Front Range and Poudre River. 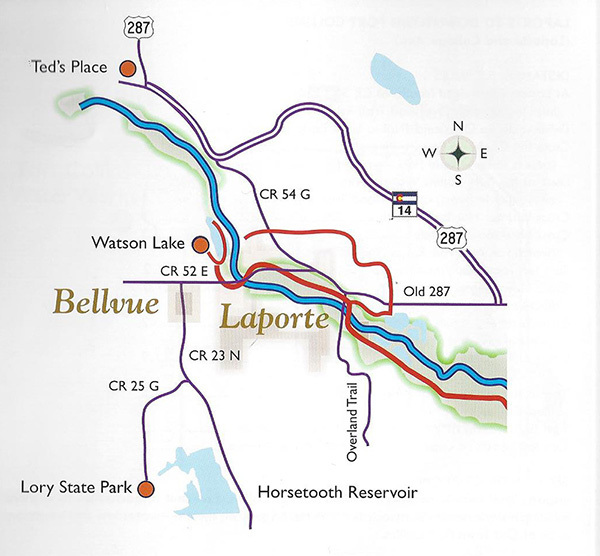 Cross one of most controversial projects associated with Heritage Area – Lake Canal. At Timnath Poudre River is less than a mile west. Box Elder Ditch: Built in 1866 and enlarged twice in next two years. Headgate located on eastern edge of Fort Collins. 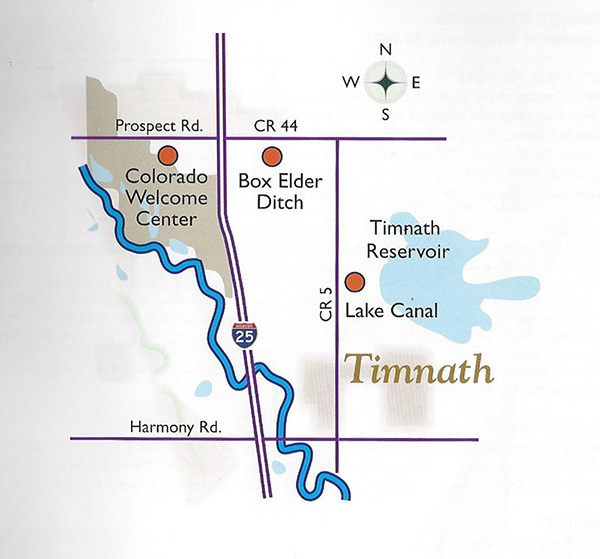 Relatively short, built to irrigate small farms between Fort Collins and Timnath. Lake Canal: Fort Collins Agricultural Colony quickly began construction of irrigation canals. In 1873, they hired John C. Abbott, former member of Union Colony (future State Auditor), and B.H. Eaton, an experienced homesteader (future Governor of Colorado), to built the ditches. The two men supervised building Lake Canal and Larimer Canal Number 2, which originated upriver from Greeley’s two canals. Being uppermost on the river, Fort Collins irrigators received ample water during the drought of 1874 while Greeley farmers were struggling to get any water. Greeley and Fort Collins confronted each other at Eaton School July 15, 1874. Union Colonists demanded that Fort Collins recognize their prior claim to the water. Fort Collins irrigators wanted a water commissioner to divide water according to greatest need. Under threat of legal action, Fort Collins irrigators relented and reduced their water use, allowing more water to flow to Greeley. * Detour 1. After traveling 2.5 miles south on CR 5, turn left (east) on CR 32E approximately 1 mile to the River Bluffs Trail Head for the Poudre River Trail. ** Detour 2. From Hwy 392 eastbound turn right (south) on CR 13 and drive half a mile, cross the Poudre River, and on left (east) side of road is another access to Poudre River Trail. 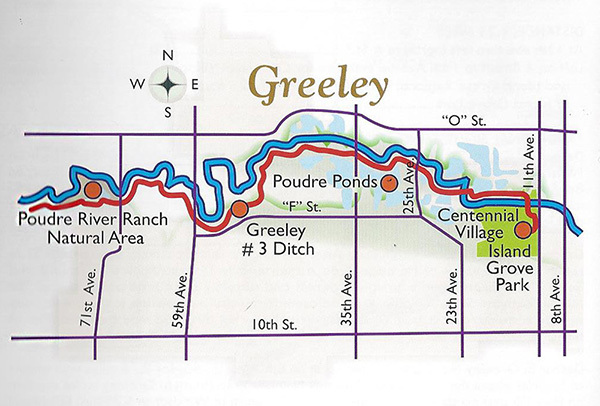 The trail travels all the way to Greeley (20+ miles). Even if you only have a few minutes, a short walk along these lovely sections of trail is enjoyable. This beatiful and peaceful section of the river is also a great place for bird watching. Just south of the CR 13 trail junction on teh west side of the road go west for about 1/2 mile for an interpretive wayside for the Kaplan0Hoover Bison Bonebed. Starts in heart of agricultural Larimer County, paralles Poudre River. 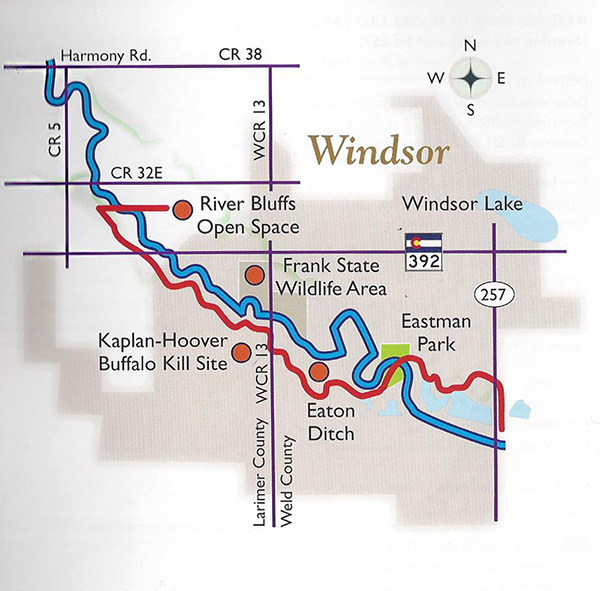 Crosses western half of Windsor, small community nestled between Fort Collins and Greeley. Windsor was home to a Great Western Sugar factory; smokestack still visible on east side of town. Eaton Ditch: In 1864 Benjamin H. Eaton built the ditch about one mile west of his original homestead. It is small and short – runs four miles before reentering river; representative of early ditches that helped settlers realize irrigated agriculture was feasible in north-central Colorado. The ditch and diversion structure can be seen from Poudre River Trail, east from CR 13 trailhead. Travels through charming downtown Windsor. Spectacular views of Rocky Mountains and agricultural landscape of Weld County. Ends at Missile Site Park with magnificent view of Cache la Poudre River Valley and Heritage Area. Old Park School (current Windsor Town Hall): 301 Walnut St.: Built in 1910, the school served students until the late 1970’s when it became Town Hall for the municipal government. Damaged in the tornado of 2008, the structure was renovated and a 1960’s annex was removed, restoring the original front of the building and adding ADA access. This is western edge of Greeley. State Farm Insurance Company’s Rocky Mountain Regional Office and JBS Swift Headquarters at Promontory Point. Mixture of urban development and agriculture typical of central Weld County. At Poudre Learning Center walk/bake Poudre River Trail, offers great opportunities for bird watching and enjoying rural landscape. Two miles west on trail is William R. Jones Ditch; one mile east is diversion structure of Greeley Number 3 ditch. Bald eagles are often spotted in this area. Open water and thousands of ducks and Canada geese provide prey making the Poudre River an ideal spot for wintering bald eagles. Cache la Poudre Reiver National Heritage Area Headquarters: Obtain a National Park Passport stamp for the Heritage area here. William R. Jones Ditch: Built in 1867 to supply water for domestic (household) use and irrigation. P.O.W. Camp 202: Located on bluffs above the river, camp housed German prisoners of war during World War II. Only remnants are gate posts for camp which can be viewed on north side of US 34 Business Route at turn to Missile Site Park. Several bunkhouses were moved into town and became apartment houses. *For great view of significant irrigation structure: Drive east on 10th St, turn right (south) at 14th Ave, 3 blocks turn right (13th St), going over ditch, and right again on 15th Ave. Drive to end of block. Return to main tour route: turn right on 12th St, left on 14th Ave, 2 blocks to 10th St, turn right. Just past 23rd Ave, 10th St becomes a one-way street and passes through Luther Park. Greeley Number 3 Ditch travels along north side of park coming close to 10th St between 21st and 18th Avenues. At 18th Ave is Greeley Number 3 Ditch, a significant historic resource listed on the National Historic Register that has retained much of its original character. 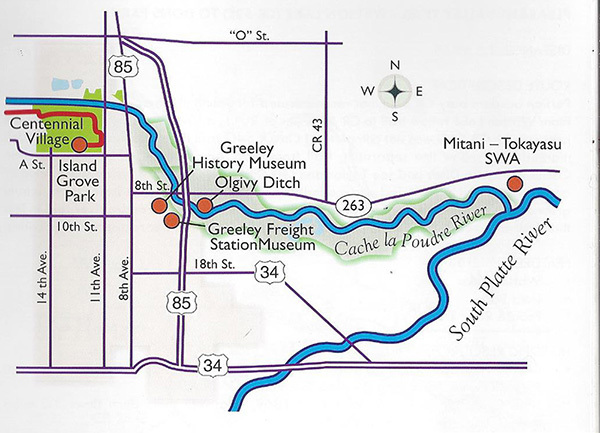 Greeley Number 3 Ditch: First canal built by Union Colonists. Union Colony originally planned four canals, but only two were built (Greeley 2 and 3). Unlike earlier ditches along the Poudre, Greeley Number 3 was cooperative effort. Each man supplied a horse or mule team and his own labor, but all Union Colonists participated in construction in some way – some planned and laid out the ditch, some physically moved dirt, and all contributed money. Greeley No. 3 provided water for domestic use and irrigated gardens in town. Water used by general public would often flow in city streets, so concrete diversion boxes, with laterals extending to individual lots, were built to control and distribute water. After Greeley Pipeline was built, Greeley No. 3 supplied water only for irrigation and garden use and continues to provide irrigation water today for city parks and agricultural fields. 1. 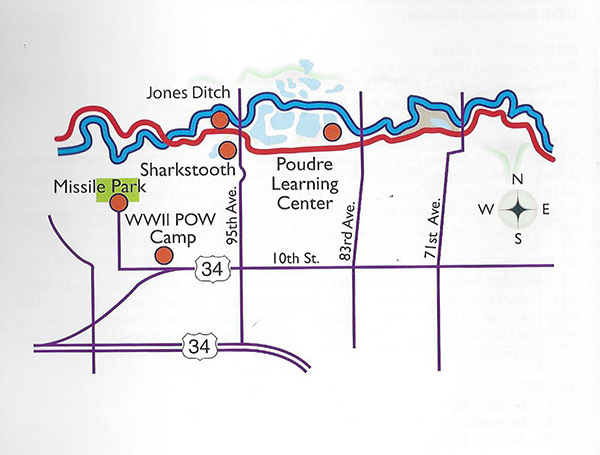 Olgivy Ditch: Continue straight on 10th St to visit easternmost ditch on Poudre River. At 8th Ave go left (north) two blocks and turn right (east) on 8th St. Cross Cache la Poudre River; continue east across US 85. Less than a mile past HWY 85 Olgivy Ditch is on right side of road. Turn left (north) on Cherry Avenue and left (west) on CR 64 to return to Hwy 85. 2. Poudre-Platte Confluence: After the Olgivy Ditch, continue east on 8th St to reach east boundary of Heritage Area a quarter-mile from confluence of Poudre and South Platte Rivers. Land is privately owned and currently there is no public access. The Mitani-Tokayasu State Wildlife Area adjacent to this site is accessible to the public (may require a stamp/permit from Division of Wildlife) – the dirt road may be impassible at times. Return to Hwy 85 by going back west on SH263. 3. Greeley No. 2 Ditch: Drive north on 8th Ave (US 85) For 2.75 miles until almost at Lucerne where the road crosses Greeley Number 2. To return to Greeley make a u-turn on Hwy 85 and go south to 11th Ave exit. 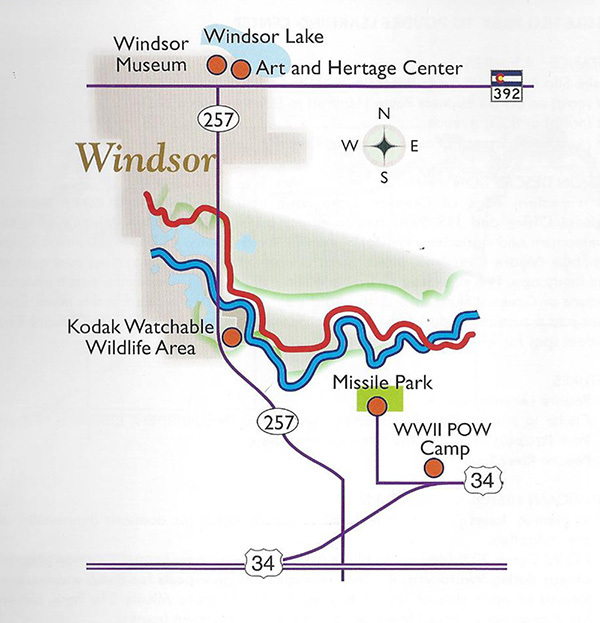 To return to Windsor or I-25 turn left (west) on Hwy 392. This route will cross the Larimer and Weld Canal – the biggest 19th century construction project; listed on National Historic Register. Highlights some of historic Greeley. Myriad opportunities for visitors of all ages. Centennial Village: A featured structure is historic boyhood home of Delph Carpenter, historic figure in Colorado Water Law. Olgivy Ditch: In 1881 Lyulph Gilchrist Stanley Olgivy, son of the British Earl of Airlie, built the Olgivy Ditch. It is the last diversion on the Cache la Poudre River before is joins the South Platte River. Greeley Number 2 Ditch: Historic ditch influential in Weld County agriculture. Union Colony planned four ditches, only two were built. Greeley No. 2 and 3 were the first large-scale, community efforts at ditch building. Greeley No. 2 was the second ditch constructed. Constructed late 1870-Spring 1871. Edwin. S. Nettleton, land surveyor from Pennsylvania and Union Colony settler, directed construction.